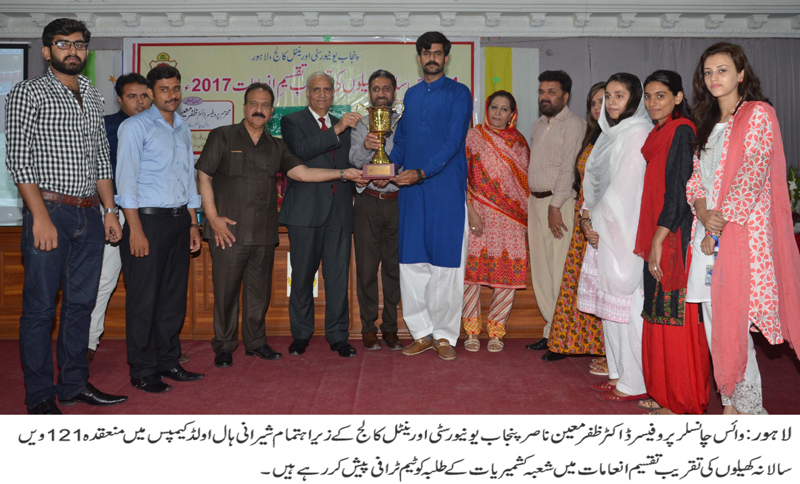 LAHORE: (Thursday, May 25, 2017): Punjab University Vice Chancellor Prof Dr Zaffar Mueen Nasir has said that PU Oriental College is playing its role in promotion of literature in the country. He was addressing the prize distribution ceremony of 121st annual sports at Sherani Hall of Oriental College here on Thursday. Dean Faculty of Oriental Learning Prof Dr Fakhrul Haq Noori, heads of various departments and a large number of students were present on the occasion. For the first time in the history of the college, cash prizes were distributed among the winning players and teams. Addressing the ceremony, Dr Zaffar Mueen Nasir said that the administration would support positive activities in the college. He said that PU administration would preserve the historical prestige and architecture of the college and provide funds for renovation and maintenance of the building. He announced five thousand rupees each for the best athletes in the competitions. 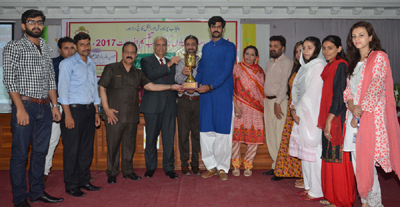 PU Oriental College Principal Prof Dr Fakhrul Haq Noori said that PU Oriental College was the best college of languages and literature in the country. He said that there was need of expansion because of growing interest of students and people at large in oriental languages. Earlier, prizes were distributed among the winners of the 121st annual sports competitions of the college. Mr Amanat Ali and Aaliya Shaheen were declared the best athlete of the event while Department of Kashmiriyat clinched team trophy in the event.